Clever idea, don’t you think? All the credit comes from my new cookbook. Imagine the crispiness of a delicate finger food served with an aromatic tomato fondue topped with melting fruity cheese, or if you feel more hungry, a plate filled with those goodies for your Sunday lunch. I promised you the story of one of my new cookbooks . So here it is. And with it, I will introduce you to Manchego cheese, if you do not yet know about it. And gnocchi of course, once more. So here we are, despite strong efforts not to give in to the temptation of buying another cookbook, I did not resist and gave in to Starters . How could I do this when so many of my old cookbooks are proudly displayed on my shelves, feeling sometimes untouched as fifty percent of the contents of some is left untested. Because it is what it is. I do not think I have ever made every single recipe from a same cookbook, unlike Julie Powell. Thinking about it, it is as if I was to start 10 novels at the same time, to never fully finish reading any. But even if you have heard me say this before about other cookbooks I praise, this one is just a touch different. 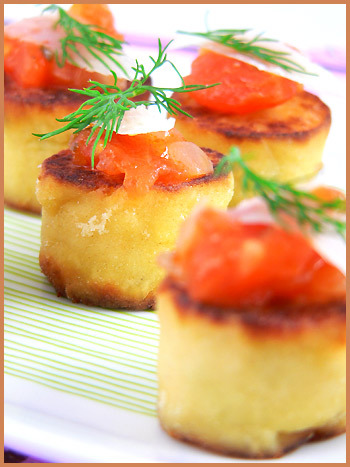 Starters cleverly features recipes, with attached attractive pictures, with the following suggestion: the dish is either served as an appetizer (a starter), or an entrée. Or finger nibbly food, just the way I love it. In one go, you get ideas of how to use the same recipe at different times in a meal. Pas mal comme idée, non? (not a bad idea, don’t you think?) I have only had the book for 2 weeks or so and I already cooked 4 recipes from it, which all turned out great, from my pumpkin soup with crystallized ginger, to the red mullet with vanilla sauce and fennel salad, a great crab salad to the dish featured in this post. I adapted the recipe slightly because I have to acknowledge that it is nice to add one’s own touch. I know what I prefer and these days, for a reason I am not explaining, I have cravings for a certain cheese and a particular herb. -I used Manchego cheese instead of parmesan. If you have not yet tried this cheese, I think you have something to do. Coming from Spain, this cheese is a lovely fruity hard-textured cheese, made from sheep milk (which I prefer to cow milk in general). Prick the potatoes with a fork and cook for about 1 hour or until tender. Leave to cool and then scoop the flesh out. Pass it through a ricer. Add the flour, chives and egg, and season with salt. Mix with the tips of your fingers. The dough should not be too wet, so if need be, add a tiny bit more flour. Divide the dough and make 7 to 8 inches long rolls and place each roll on a piece of plastic film. Roll to secure your gnocchi inside the plastic film and tie both ends. Bring water to a boil in a large pot and cook the gnocchi rolls for about 10 mns. Remove them and refresh in iced water. Blanch the tomatoes for 10s and rince in iced water. Heat the olive oil in a pan and when hot, add the chopped onion, garlic and herbs with a pinch of salt. Let sweat for 10 mns or so, until this mixture is softer. Add the tomatoes and simmer for 20 mns, stirring occasionally. The tomato fondue should be thick and reduced. Check and adjust the seasoning. 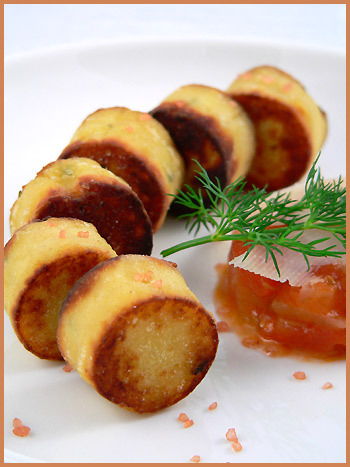 To assemble your dish, unwrap the gnocchi rolls and cut 1 inch gnocchi that you dust in flour. Heat a non-stick frying pan over medium heat. Add the butter or olive oil and when hot, sauté the gnocchi. Cook for 3 to 5 mns or until golden brown on both sides. 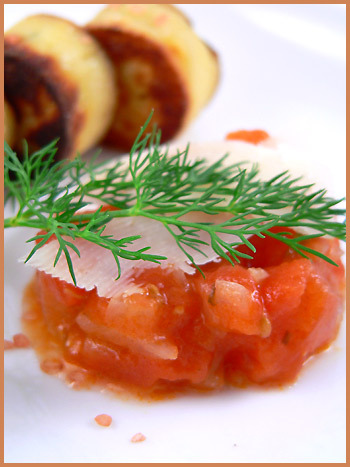 Serve with tomato fondue on top and slices of Manchego cheese. Gnocchi possess this je-ne-sais-quoi that invariably leaves me sad when they are gone. I always feel I-do-not-want-this-to-end. Can you really go wrong with potato, cheese and tomato sauce? 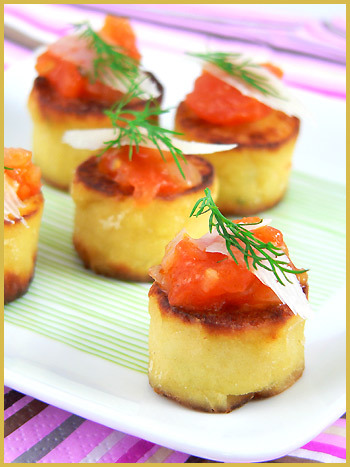 Under the finger food form, it is nibble food at its best. The perfect amuse-bouches food to present to a party, and such will be what I want to share for the fun garden party organized by Dispensing Happiness. If only the weather would be cooperative and we could actually have the party in the garden for real! Piquez les pommes de terre avec une fourchette et faites-les cuire pendant 1 heure au four, jusqu’à ce qu’elles soient tendres. Laissez-les refroidir puis prélevez la chair. Ajoutez alors la farine, la ciboulette et l’oeuf, ajoutez du sel et mélangez du bout des doigts. La pâte ne doit pas être trop mouillée. Au besoin, ajoutez un peu de farine. Divisez-la pour former des boudins de 15 à 20 cm de long. Enveloppez-les dans du papier film. Nouez les deux bouts de chaque boudin. Faites bouillir de l’eau dans une marmite et faites cuire les boudins pendant 10 mns. Sortez-les et plongez-les dans un récipient rempli d’eau glacée, afin de les rafraichir. Blanchissez les tomates pendant 10s et plongez-les dans de l’eau glacée. Ajoutez alors les tomates concassées et cuisez à feu doux pendant 20 mns, en mélangeant de temps en temps. La fondue de tomates devra avoir réduit et sa consistance est plus épaisse. Enlevez le papier film des boudins et coupez les gnocchi en tronçons de 2 cm environ. Farinez-les. Faites chauffer de l’huile dans une poêle à revêtement anti-adhésif et quand l’huile est bien chaude, faites frire les gnocchi pendant 3 à 5 mns de chaque côté. Retirez-les et mettez-les sur du papier absorbant. Décorez avec de l’aneth ciselée. oh MY! those look wonderful!! what a beautiful dish, Bea! Dear lord; I’m…jonesing for these in a *big* way! Fabulous. Just fabulous. I’m so happy you could make it to the party, Bea…thank you! Oh, je veux essayer ca, ca a l’air fabuleux Bea (je ne l’avais pas utilise encore ce qualificatif). Brava! Voilà une version originale et sûrement plus simple que que faire les gnocchis avec un dessin à la fourchette. Bea, you had me fooled! from your flickr pictures i was sure those delightfully caramelized little nuggets of goodness were scallops! Then i visited your foodblog this evening to find out they are gnocchis! how beautiful! Je suis très jalouse de tes magnifiques photos… de la recette aussi bien sûr! Mille fois bravo pour ton site magnifique! I love Manchego cheese, it has the best flavor. This looks absolutely delicious and your alterations are great! Ces photos c’est un régal des yeux ça me donnerait presque envie de goûter à tes gnocchis bien que ce ne soit pas ma tasse de thé !! J’adore la forme non-conventionnelle ! Superbes ! I look forward to hearing how the turn out Daniel! Stephanie, thank you and thanks for the organization! Gracianne, ah je suis ravie que tu veuilles essayer, j’en ai fait une double portion hier avec 800 g de p de terre! Choupette, la fourchette, c’est facile aussi, tu verras! Amanda, this is too funny! Ninnie, ahah, merci bien a toi! C’est tres gentil! bcinfrance, one thing I might have mentioned is that once the rolls are made, they can be kept in the fridge up to 3 days before cooking, or in the freezer! Natalie and Dianka, isn’t this cheese the best? So tasty! Mercotte, ah ben ca, c’est un compliment alors! Framboise, ah oui, c’est vrai, c’est different et moi, j’adore le croustillant! Merci Lilo, je suis ravie que tu ailles essayer! HI Bea, I just happened upon this post while I was looking up your gorgeous photos on flickr. I love the shape of this gnocchi and as it just so happens, I’m including my own recipe for sweat pea gnocchi on my upcoming final exam at LCB. Thank you so much for the inspiration. Ton petit train de gnocchi est bien appétissant! Je sens que je vais bientôt monter dedans. J’ai beaucoup de retard, mais tout ça a l’air délicieux, comme d’habitude ! Je salive sur mon clavier, comme d’habitude ! You are too clever, I’m loving the fingerfood idea… so much so, I will include them at my beloved’s birthday party at the end of the month. Thank you! WoW! Those look amazing! I would like to make them for an upcoming dinner but I don’t have a ricer. Do you think I could simply use a masher or put them through the holes of a colander?? Ms Glaze, great idea. I saw your gnocchi and I will have to try your recipe, they look beautiful! Bron, thanks for your sweet note. I cannot wait to hear what you think! Becky, thank you! I think the masher might be a better bet than the colander. I have not tried before so I cannot guarantee, but I think the masher is better. Oh, dear this divides time. Now I know there is BRB (before readingBéa) and now. Looks fantastic. I like your changes. I cannot resist finger foods. L’appéro is my major weakness here in France. I look forward to trying this one. Hi Bea — Beautifully prepared and presented! I’d love to make these for a 60th dinner party but was wondering if you think it would be possible to make them ahead of time? Also, I’ve never boiled anything in plastic wrap — it doesn’t melt? Thanks for any tips! Mia, yes the gnocchi rolls can be prepared ahead of time — kept in the fridge in plastic wrap up to 3 days — or they can even be frozen. You can then cook them and fry them at the last minute then. As to th plastic wrap, not a problem! Great! Thanks Bea. I’m about to begin the first part of the recipe. I hope they turn out as pretty as yours. I am a little confused – you can boil the long rolls of dough inside of saran wrap? The plastic won’t melt? How many rolls do you make?